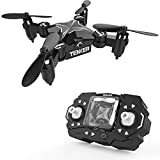 · FOLDING AND EASY TO CARRY: This mini drone can be folded into the controller, which is small and easy to carry, allowing you to create your own aerial show anywhere you want. · DESIGNED FOR BEGINS OR CHILDREN, NO EXPERIENCE NEEDED: Perform functions like one-key takeoff and landing, headless mode, EMERGENCY STOP, and more. Its functional design is perfect to be operated by beginners. · CIRCLE FLIGHT / AUTO-ROTATION FUNCTION: This circle flight feature makes flying this drone very exciting. You can fly a full 360° circle around a target at high speed. · 3 SPEED ADJUSTMENT: 3 speed modes from low to high make this drone suitable for both beginners and experts.